Former first lady Barbara Bush, the matriarch and fiercely loyal defender of the political dynasty which yielded two U.S. presidents, has died. Former first lady Barbara Bush, the matriarch and fiercely loyal defender of the political dynasty which yielded two U.S. presidents, died Tuesday. She was 92. "My dear mother has passed on at age 92. Laura, Barbara, Jenna, and I are sad, but our souls are settled because we know hers was," her son, former President George W. Bush, said in a statement. "Barbara Bush was a fabulous First Lady and a woman unlike any other who brought levity, love, and literacy to millions. To us, she was so much more. Mom kept us on our toes and kept us laughing until the end. I’m a lucky man that Barbara Bush was my mother. Our family will miss her dearly, and we thank you all for your prayers and good wishes." Her family lovingly called her “the enforcer,” a reference to Bush’s tart tongue and steely ability to keep her loved ones in line. “If you do something bad, I point it out to you,” she once explained to TODAY correspondent Jenna Bush Hager, one of her 17 grandchildren. The rest of the nation, however, would come to view Bush as "America's grandmother." Her candor and down-to-earth demeanor were as well-known as her crown of snow white hair and the triple-strand of fake pearls she wore throughout the administration of her husband, George H.W. Bush, the nation’s 41st president and the love of her life. Just weeks before her death, Bush illustrated her signature humor in a brief update she provided to the alumnae magazine for Smith College. “I am still old and still in love with the man I married 72 years ago,” she said. Bush's 93-year-old husband, who has Parkinson's Disease, also has had health issues in recent years. He was hospitalized twice last year for pneumonia and chronic bronchitis. Barbara Pierce was born on June 8, 1925, in a Manhattan hospital and grew up in the nearby suburb of Rye, New York. She met her future husband at a dance during Christmas vacation when she was 16. “I could hardly breathe, I thought he was so beautiful,” she recalled to Jenna in a segment commemorating her 90th birthday. For their first date, George told Barbara he borrowed a car with a radio because he feared they’d have nothing to say to each other. “And he tells the world now that I have not stopped talking in 75 years,” she said. The couple became engaged just before George left to serve in World War II as a Navy torpedo bomber pilot. Barbara had enrolled in Smith College but dropped out after two years in December 1944 to get married weeks later while George was home on leave. The couple celebrated their 73rd wedding anniversary this past Jan. 6. The couple kept up their correspondence while George was overseas through written letters the couple shared last year with TODAY for Valentine's Day. Following the war, George began working in the oil business and the couple moved around the country to follow his career before eventually settling in Texas. The couple had six children, including Dorothy, Marvin, Neil, Jeb and George. Their daughter, Robin, died of leukemia at the age of 3. Bush raised her children in Texas as her husband traveled for work, first for his career in the oil industry and then in politics. She managed the family's 29 moves, according to her White House biography, as her husband served as a member of the U.S. House, CIA director, U.S. Ambassador to the United Nations, and ultimately, vice president and president of the United States. Bush became only the second woman in American history to be both a wife to one president and a mother to another after her son, George W. Bush, became the 43rd president. The other first lady to hold that distinction was Abigail Adams, wife of the nation's second president, John Adams, and mother of the sixth president, John Quincy Adams. During her husband’s White House years, first as vice president in 1981 and then as commander in chief in 1989, Barbara Bush’s straightforward manner and self-deprecating humor made her a popular national figure. Even as her husband’s approval ratings dropped steadily toward the end of his first and only term as president, hers continued to climb. But her blunt commentary and quick temper also has landed Bush into trouble over the years, including when she gave her opinion about former Republican vice presidential candidate Sarah Palin (she wasn’t a fan). She also famously rejected the idea of a White House run for her son, Jeb, telling TODAY in April 2013 that “we’ve had enough Bushes” in the Oval Office. She backtracked a few years later right before Jeb made an unsuccessful presidential bid in the 2016 race. “I’m going to stop voicing my opinion and sticking up for things I think are right — except my boy,” she said just just before Jeb formally launched in his campaign in 2015. "I think he's brilliant." Bush has championed many causes, including AIDS and HIV awareness, but her primary focus was literacy. She penned two children's books, both in the voice of her dogs and the sales of which have benefited literacy. Bush would go on to oversee the creation of the Barbara Bush Foundation for Family Literacy. While she was may have been known as everybody’s grandmother unofficially, she was the real-life “Ganny" to 17 grandchildren — including Jenna Bush Hager and her twin sister, Barbara, who was named after her — and seven great-grandchildren. 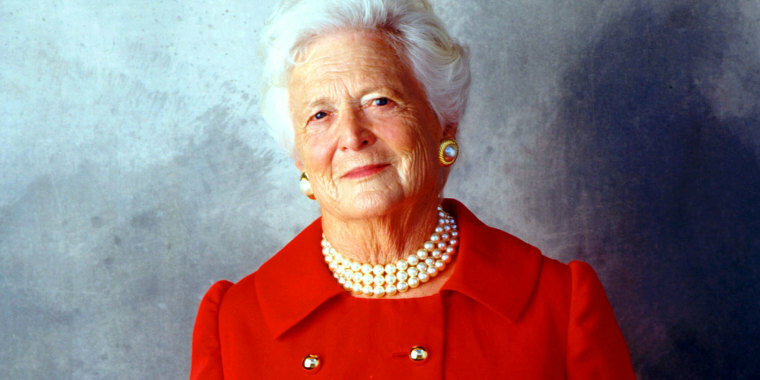 Bush's physical trademarks were her snow white hair and ever-constant strand of pearls that contributed to a grandmotherly image. She provided the stories behind both in her typical no-nonsense fashion. “The pearls are to cover the wrinkles, which they no longer do. You can't wear pearls all over your face," she told Jenna in a 2015 interview. She also never bothered to color her hair because it interfered with her love of sports. By the time a family spokesman released a statement on April 15 revealing that Bush had decided to decline medical treatment to prolong her life, the former first lady had been in and out of the hospital for years because of complications related to congestive heart failure and chronic obstructive pulmonary disease, or C.O.P.D. “I’ve been the luckiest woman in the world, truthfully," she said. "And I know it."